Remove stubborn grime while you wash! 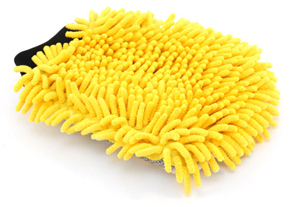 The Carrand Tuf-Spot Wash Mitt is a combination microfiber wash mitt, mesh bug sponge, and blade for removing bugs, tar, and tough grime from the auto surface. The built-in plastic blade can be employed when needed, but otherwise stays recessed within fluffy microfiber strands. The mesh edge provides extra scrubbing power where needed. The Carrand Tuf-Spot Wash Mitt is safe on clear coat, glass, and chrome. Sometimes during the car wash process, you find yourself needing more than just a mitt to remove all the grime. Bugs, tar and sap take a little elbow grease. The Carrand Tuf-Spot Wash Mitt provides everything you need to remove the stubborn stuff all built into one mitt. The fluffy microfiber holds plenty of soapy water for lubrication. It glides over the vehicle, releasing dirt and dust. For the hard-to-clean dirt, the mesh edge and the blade provide extra cleaning power. The Carrand Tuf-Spot Wash Mitt offers the convenience of everything being integrated into one mitt. You never have to stop washing to find something to remove a bit of tar. Use the flexible Tuf-Spot blade to lift it off the paint and then wash away any residue with the soft microfiber strands. The Carrand Tuf-Spot Wash Mitt is three mitts in one, plus a handy blade. 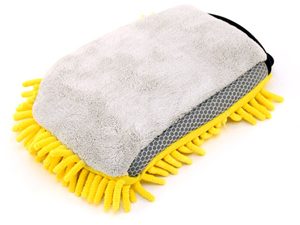 There's nothing this wash mitt can't clean! Mitt is very small and barely covers hand and fingers. Knit cuff is very very large and does nothing to keep the small knit on the hand. You will spend more time trying to keep on than you will washing with it. Why don't folks try using their products themselves before going to market with them. Just another poor product. I expect Autogeek would carry better than this. I can get this type of quality at my local wally world.